The last week has been a little rough for Callie. She developed granulation tissue at her G tube site. This means a little extra tissue has grown around the tube which can only be removed by burning it off with silver nitrate. I took her to the GI's office in Fairfax on Monday to have it done and then was given instructions and silver nitrate sticks to continue treating her at home until the tissue is gone. Hopefully we can get it cleared up and the issue will not re-occur (although apparently it often does). Then on Tuesday we had a follow up appointment with Dr. Silva, her ENT. She has had fluid in her ears which we think could be impacting her hearing, and therefore possibly her speech (still limited sounds and no words). Unfortunately the fluid is still there. The ENT is giving it 6 more weeks to clear up. If it is still there in December at our next appointment he will recommend getting tubes. :-( Then on Wednesday I had a discussion with one of Callie's night nurses. Callie has had a few episodes at night over the last month or so where she wakes up and has a hard time catching her breath. She is terribly upset during these episodes and takes a little while to settle down and go back to sleep. It has happened four times now. The nurses got together and discussed the incidents and suspect she might have sleep apnea. They recommend that I have her evaluated in a sleep study. So I put a call into her pediatrician to figure out what to do. The poor little girl can not catch a break. With the doctor appointments plus her therapies, she has NINE appointments this week. We are both ready for the weekend!! It is with great joy and excitement that I can finally share the news that Callie is officially crawling!! She has been army crawling since May, but has always had trouble getting up on her hands and knees. This is an incredible accomplishment for Callie because less than a year ago she was so stiff that we could not even bend her into the crawling position! Now she can transition from sitting, to side sitting, to all fours, and then make it a small distance. She still often goes back down into army crawling, but she is improving each week and I know before long she is going to be quickly getting around everywhere and into everything. We are amazed at how the Lord is blessing Callie and our family. I cannot thank you enough for keeping our little girl in your prayers! Callie worked hard at PT today! One of my special mom friends recently shared a link to a site about feeding tube awareness. I have been exploring this site and am finding it very helpful. 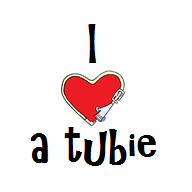 There is also an associated Facebook group and I have enjoyed connecting with some other tubie moms. I even found some who have EoE kiddos and am looking forward to getting to know them and learning more about what Callie's future with EoE might be like so that I can better prepare. Anyway, on the Feeding Tube Awareness website they have a page designed with information for family and friends. I found that I could really relate to some of their points and thought it would be helpful to share the page so that others might be able to have a better understanding of what it is like for many parents of tubie kids.